Granite is a noble stone. It is strong enough to withstand any climatic conditions, that’s why monuments to great writers, historians, artists, etc. are made from granite in many cities. 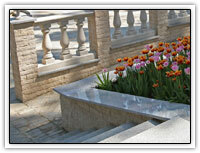 Natural granite is ideal for outdoor interiors. 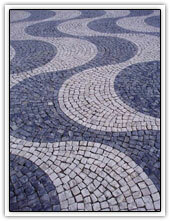 Granite - is not only a sign of image and prestige, but also rationality. Selection of facing tiles from the natural stone. Granite border stone adapts in road building. 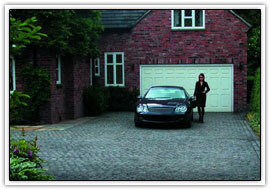 This is one of the most beautiful and very durable surfacing materials. Granite border in a minimum quantity absorbs water, steadfast to the abrasion, very dense, ultraviolet sun rays do not act on it. Because of the physical properties the border granite is plotted / paved without any problems with minimum expenditure of time and resources. Granite is deep mountain massive and dense with full-crystalized structure breed, created by the gradual cooling and crystallization of magma at high pressure inside the earth’s crust. Where did you hear about our company? Beauty and eternity in stone – is our profile! Company “Sovilit” – a dynamically developing company specializing in mining / extracting, processing and sale of products from natural stone, as well as providing services in complex geological survey, design work and consulting mining. Availability of highly skilled professionals enables us to solve problems of any complexity, and modern equipment – to work and produce products using advanced technologies. Granite is deep mountain massive and dense with full-crystalized structure breed, created by the gradual cooling and crystallization of magma at high pressure inside the earth’s crust. Due to its high mechanical characteristics and operational properties granite is widely used in building basements of structures, facing facades of buildings. 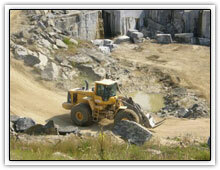 Granite traditionally use in landscape design for paving roads and floor in places with heavy traffic. 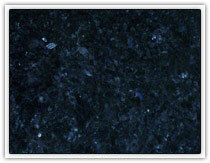 Granit is also an ideal material for countertops / tabletops in the kitchen furniture. However, with skillful use of not only the technical properties of granite, but its decorative qualities, this material can successfully fit into any interior. One of the main study of the subsoil during the diverse geological survey work - is drilling wells. 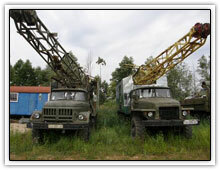 Company “Sovilit” provides excellent services in geological exploration, carries out minerals deposits’ search and full range of geological survey work, which require large volumes of drilling different diameter chinks / wells, depth and design depending on prominent features of a geological cut and specific targets which face to each chink. Except the design works, set forth above, company "Sovilit" conducts labradorite extraction on deposits «Syniy Kamin» and "Isakovsky". The given deposits concern to so named «Tourchinsky» type, which has received the name from the Tourchinsky deposit (village Novy Bobryk), which is completely fulfilled at present time and is mentioned in the literature since 1927 when on a world's fair of building and decorative products in New York the USA, has received the highest award – a gold medal as a decorative material of the highest class. Distinctive feature of the given deposits is their dome-shaped structure and small / middle grains sizes of plagioclases and feldspars. Diversity of color and structure , combined with incredible durability! This description of the merits of all products for paving natural stone. Practical Europeans have long understood, that in this case triggered the principle of “once and forever!”. But thus there is a unique possibility / opportunity to easily dismantle and move bricks / stone blocks thus changing landscape design if it is necessary. New technologies allow to produce paving materials of different geometric form, which reflected on the coating quality after paving. As a result, the coating can have perfectly smooth, but at the same time “non-slippery” surface, for operation even in shoes with heels, and “rough” surface for better grip with cars’ tires or sports’ shoes.